Clemson travels to Virginia Tech for their third game against a ranked opponent. Preview, analysis, and predictions on week five's biggest games. 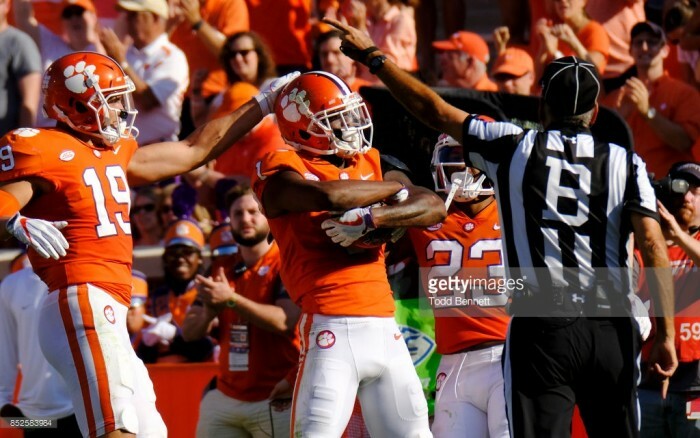 Clemson has survived everything thrown at them so far, and one can argue that the Tigers are the best team in college football. Both squads are averaging close to 510 yards per game offensively while putting up close to 40 points per game. Clemson has a slight edge defensively, but Virginia Tech is solid as well. I think the Hokies have the edge at the quarterback position as Josh Jackson has thrown for over 1,100 yards and 11 touchdowns with just 1 interception, but Jackson hasn't seen a defense close to the level of Clemson. If the Hokies can protect the football and keep the game close in to the fourth quarter I wouldn't be the least bit surprised if they pulled off the upset. A night game in Lane Stadium is always an intimidating atmosphere, but I think Clemson just has too much talent. The Tigers get it done on the road 28-24. 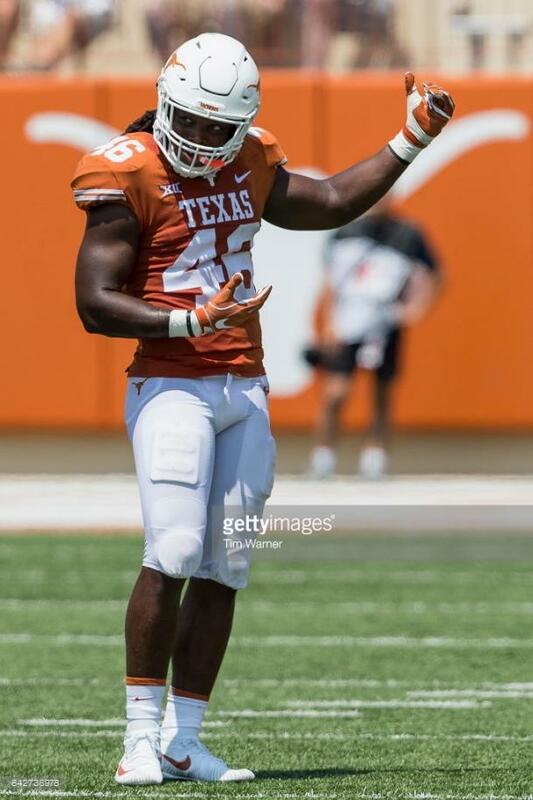 The last time the Texas Longhorns traveled to Ames, Iowa they limped back home with a 24-0 loss. Tom Herman has reminded his team that Iowa State is not an opponent that should be taken lightly. This game features two squads that match up pretty evenly. Similar offensive and defensive numbers tell me that this one will be a shootout. Iowa State has the advantage with a better rush defense, and that is the key to this game. Whichever team can establish the run will have the best chance of winning. Also, quarterback Jacob Park is playing infinitely better than Texas quarterback Sam Ehlinger. The Cyclones use the home crowd and force Ehlinger to make a few mistakes and spur themselves to a big win 45-38. 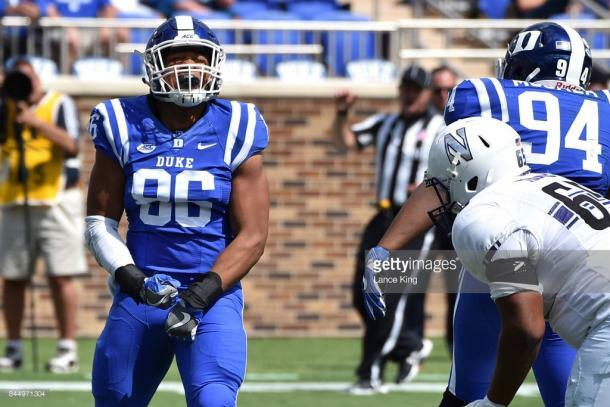 Duke freshman Drew Jordan celebrates a tackle against Northwestern. Duke is not known as a "football" school, but the Blue Devils are playing some football this season! The Miami Hurricanes are officially on upset alert. A Friday night game in Wallace Wade Stadium is arguably the biggest game Duke has hosted in years. The Blue Devils defense is one of the most solid groups in the country, ranking in the top 20 in almost every major statistic. The most important of those: Duke has the #1 third down defense in the nation. The Blue Devils get their defense off the field and control the game offensively. Also, let's not forget that Duke has also scored 3 defensive touchdowns already. Now Miami has been fantastic offensively in the two games they've played, but Bethune-Cookman and Toledo aren't the same caliber opponent as a conference foe. Don't get me wrong, Mark Richt is one of the best in the business, and he will have his Hurricane squad ready to go, but I think Duke surprises a lot of people this weekend and cements themselves as an ACC Coastal contender. Duke wins this one 28-10. Washington State QB Luke Falk looks to torch a USC secondary that has been less than stellar. Washington State has a better defense than USC. I repeat, Washington State has a better defense than USC. Mike Leach is known as one of the fathers of the "Air Raid" offense, but this Cougar team is allowing just 262 yards per game. Combine that with the 10 turnovers they've forced and this is a tough team to beat. Oh, and did I mention that Washington State also boasts the #3 third-down offense in the nation? The Trojan defense sits at #52 nationally in third-down defense. 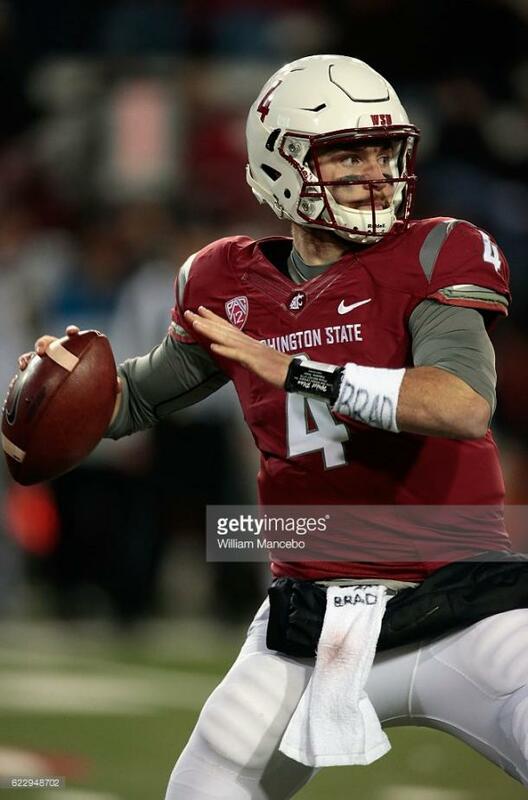 Luke Falk is playing out of his mind, showing complete mastery of Mike Leach's offense. USC gave up over 300 yards passing last week to Cal. And Texas threw for 298 against the Trojans. Sam Darnold has been less than impressive with an adjusted QBR of 74 thanks to 7 interceptions compared to just 9 touchdowns. USC is an overrated squad, and they will be exposed on Friday night in Pullman. The Cougars throw for over 450 yards and beat USC 42-28. 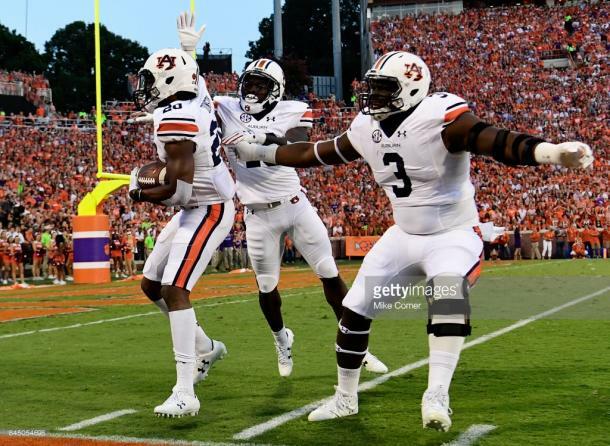 Auburn sophomore Marlon Davidson (3) celebrates with his teammates during the Clemson game. Mississippi State comes into this game licking its wounds after the beating they received at Georgia last week. The Bulldogs are in desperate need of a win, but Auburn will prove a tough customer at home. Many experts picked Auburn to be the biggest challenge to Alabama in the SEC West this year, but the Tigers have failed to impress so far. However, Auburn is sitting at 3-1 with their only loss being 14-6 at Clemson. Auburn is allowing just 236 yards per game which is good for 4th in the nation. The Tiger's front seven will cause problems for the Bulldogs, but I have concerns as to whether the Auburn offense can get clicking or not. Jarrett Stidham was supposed to be Auburn's saving grace, but he has been incredibly average in his time in control of the offense. Mississippi State is ranked 10th nationally in total defense, but they struggled to stop Georgia. I think this will be an ugly game, and the home crowd lifts Auburn late. 21-17 Tigers. 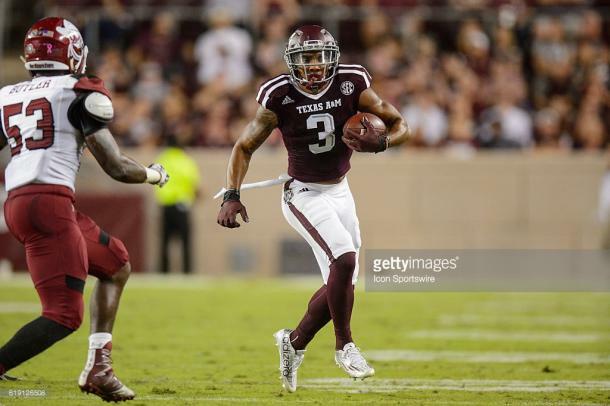 Texas A&M receiver Christian Kirk is one of the nation's most electric players. One of the most underrated matchups of the weekend pits two 3-1 programs against each other down in College Station, Texas. Despite having just one loss, Kevin Sumlin might have the hottest seat in the country. The Aggies need to deliver a big win to help relieve some of the pressure on their head coach. On the other side, South Carolina is a program searching for its own identity. A great win in week one over North Carolina State had me eyeing the Gamecocks as a potential SEC East contender, but they've lost their appeal over the last few weeks. This has been an entertaining game over the last few years, and I have no reason to expect otherwise this year. South Carolina's offense definitely felt the loss of receiver Debo Samuel, struggling against Louisiana Tech last week. The Aggies are playing well, statistically speaking, but they haven't been winning games in a convincing manner. If Kellen Mond continues to improve and plays well this week, the Aggies should win convincingly. However, in typical Aggie fashion, Texas A&M finds a way to make this more interesting than it should be and wins 42-31. Senior running back Justin Stockton (4) needs to have a good game against Oklahoma State. Oklahoma State disappointed many last weeks, myself included. The offensive line injuries proved to be huge problems for the Cowboys in their loss to TCU. Unfortunately, those problems will continue this week in Lubbock. 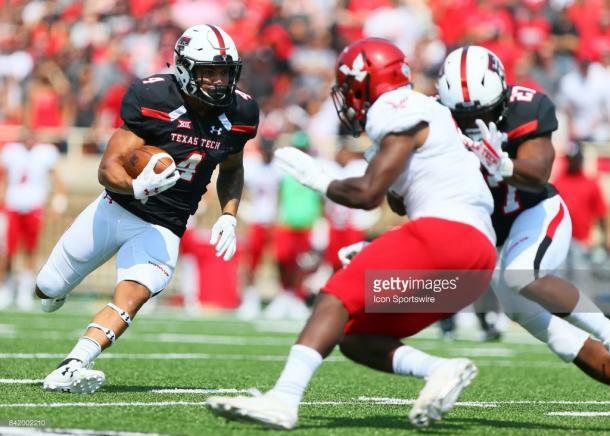 Texas Tech, as usual, isn't impressing anyone defensively, but the Red Raiders are 2nd in the nation in turnover margin. This game is going to be a typical Big 12 barn burner. Lots of offense and mistakes are going to be the only real form of a "defensive stop." For that reason, I give the Red Raiders the advantage here. Tech wins it 56-52.